One thing the left needs to do, I argued recently, is a better job of both engaging conservative arguments and using all forms of media effectively. I specifically mentioned YouTube, a dark realm that we have essentially ceded to the other side. YouTube is overflowing with videos from people like Dave Rubin and Jordan Peterson and Dennis Prager (plus about a zillion miscellaneous reactionary ranters), but who is doing well-produced left-wing explanations of why all of these people are full of crap? Well, I can tell you who is doing them. ContraPoints is doing them. And she’s doing them very well indeed. She’s on a one-woman blitzkrieg against the YouTube right. She knows how to use the medium as well as anybody, and she’s found a brilliantly inventive and totally unique way to convey left political ideas. ContraPoints produces YouTube videos. They are often quite long, and they are frequently strange. When I was first showed them several months ago, I had absolutely no idea what to make of them. Each is about a political topic, and is usually anchored by a monologue from Contra explaining the issue at hand. But they are unlike anything else I’ve seen. Contra argues with multiple versions of herself (a Stalinist alter ego, a fascist alter ego, an anarchist alter ego, a liberal professor) in a dozen different costumes. An explanation of how capitalism artificially manufactures desires might suddenly turn into a parody advertisement for suppositories. A video critiquing Jordan Peterson does not begin, as one might assume, with his dreary books and lectures, but with Contra as a bewigged French aristocrat called Lady Foppington discoursing on the sovereign faculty of reason. To my utter delight, Contra’s explanation of what’s wrong with capitalism does not end with the usual call for proletarians to take up arms but with Contra at the piano, serenading herself with a rendition of Sam Cooke’s “Bring It On Home To Me” (one of my favorite songs). But the bizarre and unpredictable aspects of Contra’s videos in no way compromise her analytical rigor. She understands right-wing arguments from front to back, and presents them far more articulately than most of those who espouse them sincerely. She concedes points where they’re valid, and is not shy about criticizing the left. (In fact, she has an entire video examining why some left-wing rhetorical tactics may be, shall we say, sub-optimal in building broad public support). On topics ranging from gender identity to free speech to Nazi-punching to trans-exclusionary feminism to Peterson’s stupid lobster thing and his concept of “postmodern neo-Marxism,” she painstakingly sorts through fallacies and flays bad arguments. She’ll tell the alt-right why their fears of “white genocide” are morally disgusting and statistically illiterate, or she’ll use the history of redlining and housing discrimination to show exactly how historic injustices created today’s racial disparities. And it’s fun all the way. She’ll explain the concept of race with an impersonation of an early 19th century phrenologist, or expose the cruelty of fat-shaming while recreating a 1980s home exercise video. And sometimes she’ll do these things in German or Japanese, or from the bathtub, or through a parody of Dave Rubin’s slobbering sycophantic interview show. A willingness to actually respond carefully to right-wing ideas, and a recognition that bad ideas don’t go away by magic. She has an understanding that “engaging with” does not mean “legitimizing,” which she demonstrates by viciously mocking the white supremacists and transphobes whose ideas she is so unusually intellectually generous to. She shows how debate should be done: not by giving an inch to poisonous ideas, but by bringing superior smarts, funnier jokes, and more elegant costumes to the fight. Media savvy: The production values on her videos are excellent, and getting better all the time. She understands the YouTube community, and how to present the pro-social justice position in a way that isn’t excruciating to sit through. Let’s be clear: This in itself is a formidable achievement. Humility, nuance, doubt – she makes clear that she is still figuring things out all the time, and often gives a perfectly honest “What do I know?” She knows the world is complicated and always gives her critics a chance to teach her something. That doesn’t mean, though, that she does mushy “on the one hand” indecision. When she knows she’s right about a basic moral issue, she doesn’t equivocate. And while there’s a lot of irony in the presentation style itself, Contra is also deeply sincere, warm, and personal rather than cynical or superior. Lack of academic theory and alienating language – Contra is a former philosophy PhD student who dropped out of graduate school for exactly the right reasons (i.e., that academia is intellectually stifling and requires one to spend time producing highly-specialized pretentious irrelevancies that nobody will ever read or care about). When she explains the difference between use-value and exchange-value, she doesn’t do it by summarizing Capital, but by using the BuzzFeed video series Worth It in which three doofuses travel the world eating expensive but disappointing food. To illuminate free speech, she doesn’t throw Areopagitica at her audience, but uses clips from an It’s Always Sunny In Philadelphia episode. Yet because Contra knows her philosophy, we also know she could cite Areopagitica if she felt like it. She excels at finding ways to make old ideas come alive and feel relevant to our actual lives, and she shows how one can be intellectual in the sense of loving to read and discuss philosophy and literature without being An Intellectual in the sense of being detached and useless. An actual sense of humor – One reason it’s sometimes hard to listen to leftists is that even when they’re absolutely correct, they can be sanctimonious and humorless. (I think Democracy Now is an extraordinary program and a valuable asset to journalism, but I dearly wish someone would tell a joke on there from time to time.) Contra is funny and delightful and weird, and she shows that you don’t have to be an idealogue or a buzzkill in order to believe that the world needs to be a more humane and just place. She’s a living demonstration of the compatibility of socialist politics with joie-de-vivre, wit, and occasional decadent indulgence. (Nobody could fear that her utopia would be dull or spartan; she’s clearly for a luxury left, which is the right kind of left). The project seems to be working so far. She’s got a healthy support base on Patreon and just hit 100,000 subscribers on YouTube, with millions of total views. It’s impressive considering that she seems to do nearly everything herself and has persisted while enduring a predictable torrent of transphobic abuse and vicious social media comments. I have to admire her sheer gutsiness in trudging into the right-wing cess pit, alone, as a transgender woman, and challenging them all to a serious debate. Who else is doing this? Who else would dare? ContraPoints is, needless to say, not going to successfully counter the online right singlehandedly. I am sure her videos are too weird for some people and I wouldn’t use them to introduce, for example, my grandmother to left ideas. But if you watch her and wonder what on earth I’ve gotten you into, well, that was my first reaction too. She’s speaking to a very particular audience, though: young people on YouTube, the kind who could easily get taken in by bad ideas that go unrefuted. And she’s speaking to them in the language they understand; millennial humor is weird. Contra’s videos achieve something remarkable: They are entertaining enough to hold the attention of someone whose attention span has been destroyed by the internet, so that such an individual might even last through a 20-minute explanation of the modern-postmodern distinction or a tour through the history of residential segregation in Baltimore. I don’t think all leftist forays into online video should try to imitate Contra’s approach (for one thing, she’s inimitable), but they should definitely all take note of what she does. It’s smart, it’s persuasive, and it’s fun. More of this sort of thing, please. God bless ContraPoints. She’s a national treasure. 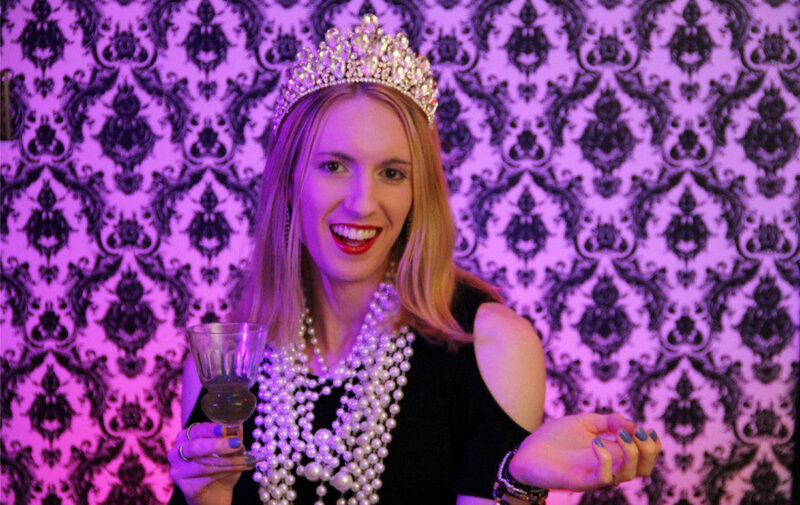 You can become a Patreon support of ContraPoints here and subscribe to her YouTube channel here. 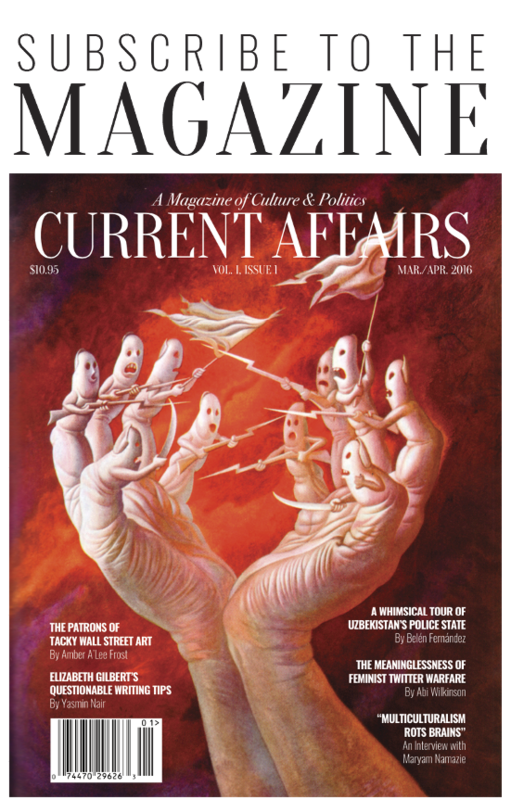 If you appreciate Current Affairs, please consider making a donation or purchasing a subscription. Current Affairs is not for profit and carries no outside advertising. We are an independent media institution funded entirely by subscribers and small donors, and we depend on you in order to continue to produce high-quality work.